Taking some time out to relax is good for the soul. We all need to dedicate time to resting and relaxing but it's something that most people find difficult to do. Trying to find balance in a busy life is no easy task but it is essential - burnout can occur from illness, working long hours, being a parent (which can mean broken sleep), partying hard or a combination of all of the above so taking a small amount of time out to relax is a must. Sometimes even the idea of a pamper session involving a facial, defuzzing and a hair mask can seem like hard work so today's post is purely about relaxing and features some gorgeous products from L'Occitane's Relaxation range. For me, a relaxing evening essential is a candle and this L'Occitane Luxury Lavender Candle is perfect. I adore the scent of lavender as it brings back so many happy memories from my Granda's garden and he used to give me some sprigs of lavender to put under my pillow. The scent instantly loosens my shoulders and helps me to unwind. This particular candle has a very natural, rather than synthetic, scent and it fills the room with the relaxing aroma as soon as I light it. Most products aimed at relaxation and sleep smell predominantly of lavender, but if you aren't a fan of that particular scent, you might just love the L'Occitane Relaxing Shower Gel. It contains a combination of essential oils of geranium, bergamot, mandarin, sweet orange as well as lavender but I don't find that the lavender comes through particularly. It isn't a sharp citrus scent despite the inclusion of mandarin and sweet orange, instead it smells mildly spicy and fresh but not revitalizing. This product can be used in the bath or shower (not everyone has a bath or even has the time to take a bath but you can still feel relaxed!) and it lathers well but doesn't leave the skin feeling at all stripped. I find that by layering products, the scent lasts longer so I follow up with L'Occitane Relaxing Massage Oil. Ideally, I would have my husband massage by back and neck with this oil but even if he isn't around, I can still benefit from massaging it into my chest and arms so that I can inhale the aroma. It's quite a rich oil so I personally would only use it in the evening before I put my pyjamas on so the scent will linger even longer on those. Only a small amount is needed as it does spread really well so this 100ml bottle will last several months. I've used it on my husband too and he said he felt instantly relaxed and de-stressed from the scent. 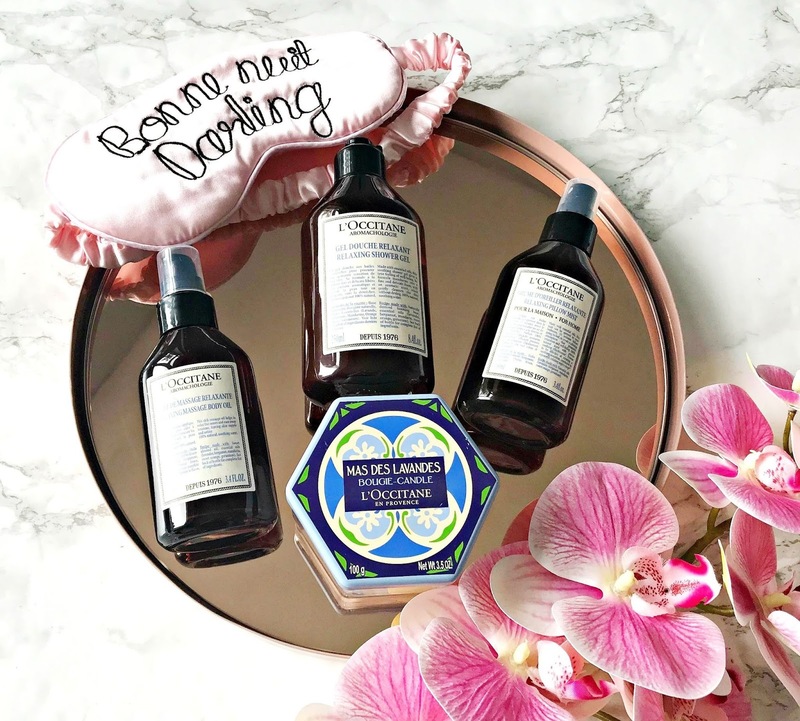 If you've read my blog for any amount of time, you will know that I am a huge fan of pillow mists and this L'Occitane Relaxing Pillow Mist is no exception! It has a fine mist and with the same scent combination as the other products in the line, it continues the relaxing experience and helps me drift off to sleep. I love the old style apothecary bottles of the products in this line and I expected the prices to be much higher but they range from £16 to £24, which I think is really good value. You really can create your own spa at home with this range of products and you are guaranteed a relaxing evening with them. I'm kinda addicted at the moment and every evening is a relaxing one, which really helps when the temperatures are high and the humidity makes it difficult to switch off! I'd love to hear your thoughts on these products and what you like to do to help you relax and switch off?